The 18' Broom Head with soft bristles is made with natural coco (coir). An economical soft broom suitable for smooth dry surfaces. Uses standard 15/16' wooden handles. The ISO11033 18' wooden broom head with stiff bristles is made with natural bassine. It is an ideal broom for the sweeping of hard surfaces. We recommend the use of a bracket with this larger sized broom head to ensure stability and durability. The code for the bracket is STAY 01, please follow the link at the bottom of the page for further information and to purchase this bracket. 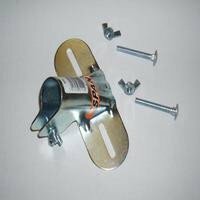 Metal bracket to give extra stability when attaching large broom head to handle. Supplied with butterfly nuts and bolts for secure fitting. Especially recommended for broom heads larger than 18'. Q. Can i use the STAY 01 on smaller broom heads and will it work on plastic heads? A. You able to use the STAY 01 on any wooden broom head, however on a 12' broom you don't normally require a Stay.You may be able to use with plastic broom heads depending on the strength of the plastic.